For the most part, I avoid the fakes, because I don't particularly like shopping and the places where you would go to buy the fakes require you to haggle and bargain, which takes me from simply disliking shopping right into the land of hating it. I confess I did buy that Faux-lex watch, along with a really great copy of a Luis Vuitton handbag back in 2005 in Hong Kong, and I mainly did it for the experience. Riding in an elevator with a guy holding a walkie-talkie, then down a dimly lit hall into a tiny apartment stuffed with fake handbags really late at night... It was crazy and slightly dangerous and a little bit fun. But having done it one time did not whet my appetite for more. And the fate of the handbag? I gave it to a friend, who in turn gave it to another friend and now who knows where it's at. It was actually such a good copy that I began to fear someone would steal it off my chair at lunch or mug me for it, so I really only ever used it half a dozen times (and got half a dozen compliments each and every time). Plus, I'm not a luxury goods type of girl. A luxury travel type of girl? Yes, oh YES. But stuff is stuff and as long as what I have makes me happy and is useful, a label isn't going to raise my enjoyment of it. Welcome to my new happy place, CaliBurger. There are actually three CaliBurgers in Shanghai, and the one in the photo above is a dangerous and delicious ten minute walk from my doorstep. 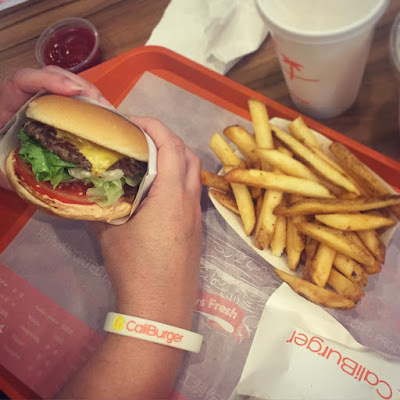 CaliBurger first opened here in Shanghai, and then spread to Hong Kong, the Philippines, and is now opening soon in America. They aren't shy about saying that it was In-N-Out that inspired them, and they have faced some litigation (which doesn't seem to have stopped them from opening new shops). Their menu is similar, but with added, non-beef options (see it here). And instead of "animal style" fries, they have "wild style" fries. Plus, they sell alcohol, including boozy milkshakes (we sampled the booze-free selection). But how does it taste? Granted, my last authentic In-N-Out Burger experience was six months ago. But I'd say it was very, very tasty. It's also similarly economic in price starting at about $5 for a combo with a fountain drink and fries, as compared to other burger joints that charge $15+ for a cheeseburger here in Shanghai. My one disappointment is that unlike the real In-N-Out, there is no Barq's Root Beer as a choice in the fountain drinks. There's actually no fountain root beer anywhere in China (someone, please prove me wrong... I've been searching for over three years and haven't found it anywhere!). I know not everyone is a fan of In-N-Out Burger (hi Rachel) and that other people are rabid fans of it (hi Dad). I'm just grateful that the longer we live here, the more options we have to make us want to stay here. It's pretty much win-win. And based on CaliBurger's popularity here in China, I'd say In-N-Out would do just fine if they ever wanted to do more than just these annual pop-up shops around Hong Kong! LOL I was reading your post and thinking, "I am just un-Californian since I don't care for In-N-Out..." But I didn't expect a shout out in your post. Ha ha! I even bought it for Mark last night for a treat...decided to buy fries animal style since I don't like them plain...but no, I still don't care for them. BUT, I DO like a good protein style burger from them. Mmmmm. But with a bun or with fries - not so much. :) Happy you found a substitute in China!!! I would be careful what kind of beef you eat in Shanghai...Especially from a restaurant that does not mind ripping off another's image who worked so hard for it....Check out the videos on YouTube channel "China Uncensored". I am sure you know about that channel since you are in China right now. Oh but wait do you have access to that channel since you are in China?